Brazil Natural Cerrado- Sample - 3 oz. Brazil Natural Cerrado - Small-14 oz. 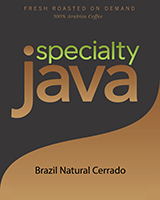 Brazil Natural Cerrado - Regular-30 oz. Brazil Natural Cerrado - Large-40 oz. Brazil Natural Cerrado- Bulk-80 oz. Brazil Cerrado coffee is widely popular coffee and is used both as a single origin brew for those who want a mild cup and is used extensively in espresso blends. While mild, it has nice, sweet, subtle chocolate and walnut tones. As it cools in your cup, the flavors really emerge. Very popular for those who want a low acidity coffee. Cerrado is a natural dry processed coffee creating a complexity of flavors. Cerrado is a large coffee growing region in Brazil. Cupping Notes: Sweet, honey, chocolate, walnut, mild, full body, smooth finish, low acidity.